Sweeten evaporated milk with powdered sugar and a touch of vanilla before whipping it into a foamy topping for cocoa, pie or fresh fruit. A bit of gelatin will give it staying power for a beautiful presentation. Beat on high speed for 1 minute or until very frothy. Gradually add sugar and vanilla extract; continue beating for 2 minutes or until mixture is stiff. Serve immediately spooned over fresh fruit or your favorite dessert. Tip: For Whipped NESTLÉ® CARNATION® Evaporated Milk that holds up to 30 minutes: Sprinkle 1 teaspoon gelatin over 2 tablespoons water in small, microwave-safe bowl; let stand for 2 minutes. Microwave on HIGH (100%) power for 40 seconds; stir. Let stand for additional 2 minutes or until dissolved. 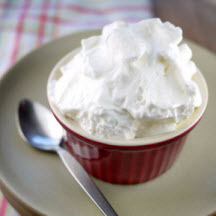 Pour 1 cup NESTLÉ® CARNATION® Evaporated Milk or Evaporated Fat Free Milk and dissolved gelatin into small mixer bowl; follow recipe for Whipped Topping. Serve immediately or cover and refrigerate for up to 30 minutes.